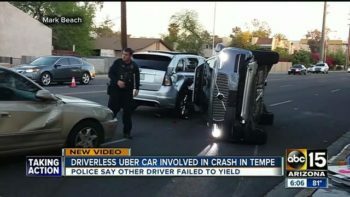 Media outlet Business Insider has published details of a meeting at Uber this week where CEO Dara Khosrowshahi and head of the self-driving unit Eric Meyhofer were questioned by employees. The paper has revealed staff asked the two bosses about the allegations of infighting in the unit ahead of a tragic accident which resulted in the death of a pedestrian. It follows the revelation that engineers deliberately turned off the car’s ability to stop itself quickly ahead of the death of Elaine Herzberg in Arizona. CEO Khosrowshahi even told staff several times the company had “screwed up” as staff gathered to quiz their bosses. The top question asked by staff was regarding an investigation published by Business Insider last week into the self driving car unit known as the Advanced Technologies Group (ATG). Both Khosrowshahi and Mayhofen did downplay the story, trying to discredit the media and imply that it was not factual – although no reports of action against the publication appear to have been made nor have any retractions and apologies occurred which is the usual preliminary stage in any such disputes. The two even indicated the story was a result of Business Insider contacting former employees and others who did not work at the company asking for “sensational” information. In their report on the meeting, Business Insider refuted the allegation and said they had talked to a number of people who were all employees of the company on the 18th March 2018 when the incident occurred. We corroborated employee accounts with emails, internal documents, police reports, and other documents. Business Insider also shared all of what we learned with the company prior to publication and included the company’s feedback and statements in the story. Meyhofer defended the culture by quoting scores from an internal employee survey, telling everyone that the survey scored “83% for trust. 83% for teamwork and collaboration.” However others report that the 83% score is not the result for trust or teamwork but is in reference to how they feel about the company’s commitment to safety. The results of the survey have not been released to employees, but they also include a score for “trust and transparency,” not “trust and collaboration,” the paper reports. Sources had said that Khosrowshahi had not been paying much attention to the self-driving car unit in his first year because he was so busy fighting fires with Uber’s main business, but that this is changing now, something he seemed to suggest at the meeting.